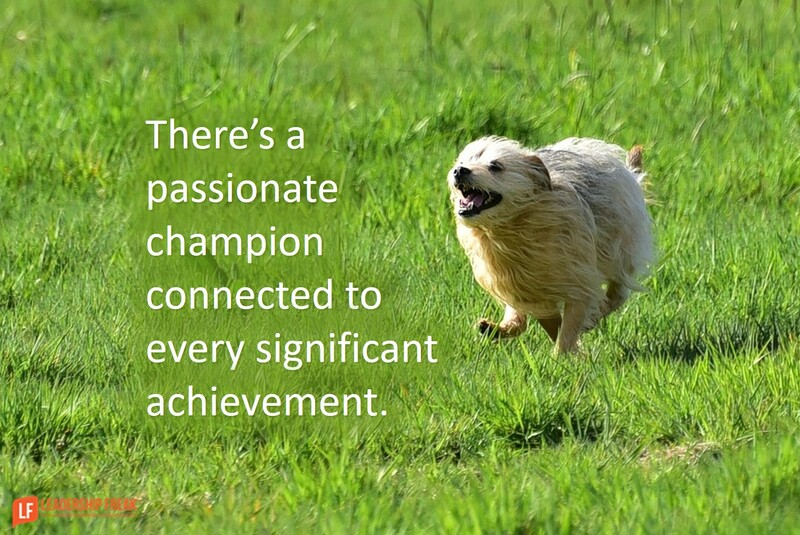 There’s a champion connected to every significant achievement. The trouble with corporate teams is they feel too little. Great ideas apart from passionate champions never soar. What ignites fire in your heart? Do that. Pick up the ball and run. You might nudge them, but they always end up taking ownership. You don’t have to pressure someone to do what they love. See a need and fill it because they want to, not because they have to. Complain that others don’t get it. Complaints reveal commitments. Don’t soothe the complaints of champions. Explore their commitments. Imagine themselves as contributors. Imagination ignites energy. You imagine success before you achieve it. Work when others aren’t watching. Recognition is helpful, but not necessary for champions. Make champions of others. The energy of champions pulls fringe people into the battle. Commitment invites commitment. Going through the motions never ignites passion in others. People follow dedicated banner-wavers. Offend the uncommitted. Complaints about champions reveal lack of commitment by others. Press through, rather than make excuses. Say no! Perhaps the most important aspect of being a champion is saying no to good ideas so you can pour yourself into a single great idea. Give energy rather than drain it. Protect their passion. Don’t let them get involved in everything. Fuel their fire by noticing their progress. Confront naysayers. Never let those who aren’t doing much be the reason you hobble a passionate champion. Lift champions out of the weeds so they can see their contribution. Help champions see where they’re banging their head against the wall. Passion blinds champions. Remind them to take simple-next-steps when they’re impatient. Great ideas never outperform a single-minded champion with an average idea. How might leaders identify and maximize champions? How might leaders protect champions?